105 mm L/40 SK C/0412 х 1 pcs. Dresden — German Tier II cruiser. A typical German protected cruiser of the early 20th century. Dresden could serve as a scout or raider, or cover a ship squadron from enemy destroyers. She boasted a high speed for her time and very good protection. Compared with the majority of enemy cruisers, she was fitted with numerous yet less efficient guns. The German cruiser line truly begins here at Tier II with Dresden. Along with Tier III's Kolberg, she is something of an anomaly in the overall context of the branch in that both ships will spend most of their time firing high-explosive shells at enemy cruisers and destroyers. Given that her main battery is comprised exclusively of 105mm guns, Dresden will frequently spew out dozens and dozens of shells for minimal damage. Her guns are effective against enemy destroyers, but that effectiveness falls off quickly against cruisers and battleships. Her armor piercing shells lack adequate velocity and power to penetrate anything but other lightly-armored cruisers, and even then only at point-blank ranges (5.0 km or less). The arc on Dresden’s shells is fairly high; landing hits at maximum range will require a significant amount of lead, and AP damage at such ranges will be low or non-existent. 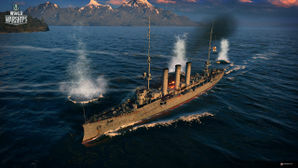 Smart captains can use Dresden’s shell arc to her advantage, however, by using islands as cover and firing over them. Most players won't spend but a few games in Dresden, which makes her faults and weaknesses easy to overlook. Overall, she is a fragile ship with relatively weak guns that excels at eliminating enemy destroyers but struggles against most anything else. High rate of fire for her main battery guns. Most barrels of any Tier II cruiser; roughly comparable to Tier III's Bogatyr or St. Louis. On the fast side for Tier II cruiser. Shortest firing range of all Tier II cruisers found in the regular tech tree. Large turning radius for a ship her size makes dodging torpedoes a challenge. Hull: Upgrade to Hull (B) for more health, faster rudder shift time, and more main battery guns. Gun Fire Control System: Upgrade to FKS Typ 2 Mod. 2 for an extra 10% range on the main battery. Propulsion: There is no propulsion module upgrade, but access to the beginning of the German destroyer branch (V-25) stems from here. Hull (B) is the top upgrade priority; not only does it increase Dresden’s health pool, but she gains one more barrel in each broadside. Pick up the Fire Control System range upgrade second. Dresden only has access to Upgrade Slot 1. Given the bare handful of games most captains will spend in her this is a fairly minor upgrade; either Main Armaments Modification 1 or Magazine Modification 1 ( ) are recommended. 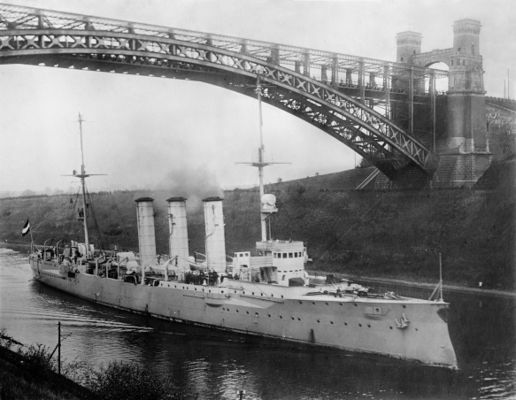 The light cruiser Dresden passes through the Kiel Canal, 1910. Laid down in at the Blohm and Voss yards in Hamburg in 1906, SMS Dresden was launched on 5 October 1907 and commissioned into the German High Seas Fleet in November 1908. She was one of five large cruisers ordered following the passage of one of the amendments to Alfred von Tirpitz’s original fleet plans drafted in 1898. Armed with ten (10) 105mm guns, she and her sister ship Emden had a twofold role in the High Seas Fleet: to serve as advance scouts and escorts when sailing with friendly capital ships, or to act against enemy commercial shipping when operating independently. By early 1914, Dresden found herself operating in the Caribbean Sea, representing German interests in the area. The Mexican governments of the era were fairly unstable, and she spent much of her time occupied with assisting friendly-flagged vessels in Mexican ports or ferrying German citizens out of the country. In mid-July she transported the recently deposed Mexican president to Jamaica, where the British had granted him asylum. She was scheduled to return to Germany for refit and overhaul, but upon arriving in Jamaica learned of the mounting tensions in Europe that culminated with the Austrian declaration of war against Serbia on 28 July. Three days later, Dresden was advised that war was imminent and ordered to operate independently, raiding enemy commerce where possible. She turned southward and made for the Brazilian and Argentinian coasts. She had limited success as a merchant raider — largely due to a dearth of targets — and in September received orders to round Cape Horn and link up with the German East Asia Squadron under the command of Vizeadmiral Maximilian von Spee. Dresden complied, rendezvousing with von Spee off Easter Island in October 1914. Dresden saw action in two battles against the Royal Navy under von Spee’s command, emerging victorious at the Battle of Coronel in November, but her squadron fared worse during the Battle of the Falkland Islands the following month: Dresden was the only German ship to escape destruction. She evaded the British fleet for the remainder of the local summer, continuing to raid enemy shipping while nearly a dozen Royal Navy units hunted for her. She put in at an island off the Chilean coast for coaling and repairs in mid-March 1915, where Fregattenkapitän Fritz Lüdecke — low on coal and spare parts for his boilers — made the decision to intern his ship and crew in Chile for the remainder of hostilities. Unfortunately for Lüdecke, Dresden was discovered by a force of British cruisers the following morning. Whether she was sunk by enemy action or scuttled by her crew is a matter of some debate, but whatever occurred, 15 March 1915 marked the end of Dresden’s participation in World War I. Today, the remains of SMS Dresden lie in 70 meters of water near Robinson Crusoe Island, 400 miles west of Valparaiso, Chile. In 2006, the ship’s bell was recovered by a team of Chilean and German divers. The Republic of Chile restored it, and subsequently presented it to Germany in November 2008 to commemorate the 100th anniversary of the ship’s commissioning. It is on display at the Museum of the German Armed Forces in Dresden, Germany. Line-drawing of the Dresden class. Dresden visiting New York City in October 1909. Dresden, Victoria Louise, and Hertha during the Hudson-Fulton Celebration in 1909. Dresden at anchor, probably before the war. Dresden, flying a white flag in the moments prior to sinking, 15 March 1915. This page was last modified on 13 March 2018, at 16:30.